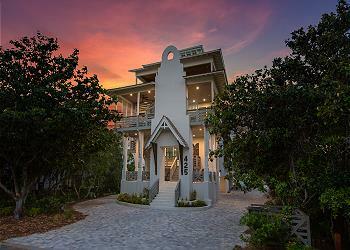 LOCATION: This home is a 1 minute walk to the beach. 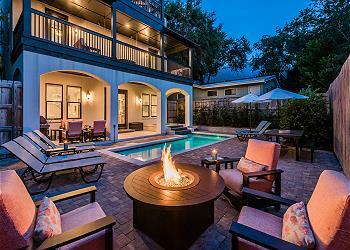 DETAILS: The ultimate luxury vacation awaits in this Spanish-Mediterranean style Rosemary Beach home. With sleeping accommodations for 17 guests and a quick, one-minute walk to the beach, it’s the perfect property for your large group. The entryway leads directly into the main living space, which offers a plush seating, as well as a large mounted flat-screen television. The chef’s kitchen is equipped with premium appliances, including a gas range and double ovens, and is a wonderfully inviting place to prepare meals. This kitchen also features a custom, built-in refrigerator/freezer and a large kitchen island with bistro table—a perfect place to serve and enjoy hors d’oeuvres while preparing dinner. The dining space provides seating for 8, with additional seating for 4 available at the island bistro table. 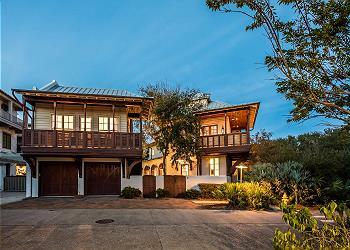 The first floor of this home features stunning whitewashed cypress wood ceilings throughout. On this floor is a guest bedroom with king bed and shared bathroom with a shower. Up the beautiful wood spiral staircase is the second level with two additional bedrooms. The master suite features a king bed, two private bathrooms—one with a luxurious soaking tub and single vanity, and the other with a shower and single vanity—and French doors which provide lots of natural light and lead out to the private balcony. The second-floor guest room offers a comfortable king bed and a private bathroom. The third floor is a perfect space for the younger guests. Three cozy bean bag chairs and a flat-screen television await on the landing. There are two additional guest bedrooms on this floor—one offering three twin beds and a double bed, the other featuring four twin beds. Both bedrooms on this floor share a bathroom with a shower/tub combo. The final bedroom in this home is in the Carriage House, which features a lovely king bed, a queen sleeper sofa, and bathroom with shower/tub combo. This space also offers a mounted flat-screen television, dining table with seating for four, and kitchenette. The Mediterranean design influences continue out to in the private courtyard and outdoor space, where the gas lanterns and half-round transom wood doors almost steal the show. The gem of the outdoor space is the huge, sparkling pool, which sits ready and waiting to provide hours of entertainment and respite from the warm sun. Guests in this home will enjoy the additional amenities it offers, including the 1-minute walk to the sugar white sand beach, the 6 complimentary adult beach cruiser bikes on site, and access to four Rosemary Beach pools. Contact 360 Blue to book this incredible property today! My sorority sisters and I so enjoyed our 30 year pledge class reunion at "Serenity Now." The folks at 360 Blue were amazing helping us to arrange wine tastings, in house massages, and a personal chef. The house itself was perfect for 13 of us but we could have slept more. The kitchen and living room were perfect places for us to gather. We had an amazing time and are planning a return visit next year. We are so thrilled that you all enjoyed your stay with us in Rosemary Beach and that your experience with 360 Blue was a positive one! We agree this home is perfect for larger groups with plenty of space to visit with everyone! Thank you for staying with 360 Blue, we hope to see you all again soon! We are so glad that you enjoyed your vacation with us in Rosemary and we look forward to seeing you again very soon! This has been a great family vacation. The house was wonderful and 360 Blue was a pleasure to work with. They were very attentive and responded immediately with all requests. We will definitely be back. We are so glad that you and your family had a wonderful stay while in Rosemary Beach on vacation! The photo you shared is absolutely adorable! We are thrilled that you had a great experience with us at 360 Blue and we look forward to hosting you all again very soon!